In 1988, while shopping at the old outlet mall on Northwest Expressway and Council Road in Oklahoma City, I had the good fortune of running into a group of college students from the Soviet Union. They were Gen Xers just like me, and after years and fears of the Cold War that framed so much of our childhoods and youth, I walked right up and introduced myself to them. They were shy and hesitant, and they spoke no English. 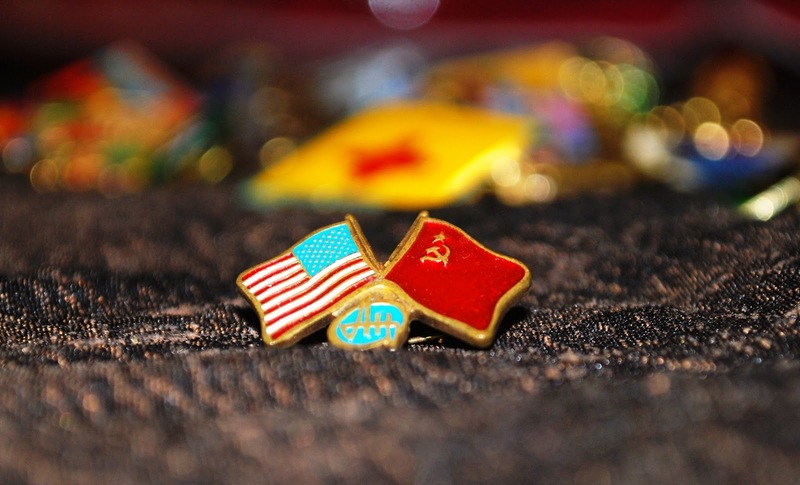 Our exchange lasted only a few minutes, but by the time we parted ways they had placed a lapel pin of the USA and USSR flags in the palm of my hand. I have kept it in my jewelry box among a variety of other souvenir pins for nearly 25 years. It has always been a reminder to me that the future can’t be predicted by no one, and sometimes, the unbelievable can happen. Walls can come down and cold wars can thaw. Republics can gain independence and super powers can dissolve. Enemies can become friends and friends, God help us, can become enemies. The 20-year anniversary of the dissolution of the Soviet Union just passed. It formally ceased to exist on December 25, 1991, the same day General Secretary Mikhail Gorbachev resigned from office. The event was not formally commemorated in Russia, where Soviet nostalgia has been on the rise since the late 1990s. Most Soviet nostalgia is for everyday objects that belonged to a culture that reportedly vanished immediately following the dissolution of the empire. Then there is nostalgia of the Putin variety. In April 2005, the Russian Prime Minister called the collapse of the Soviet Union the biggest geopolitical catastrophe of the century. 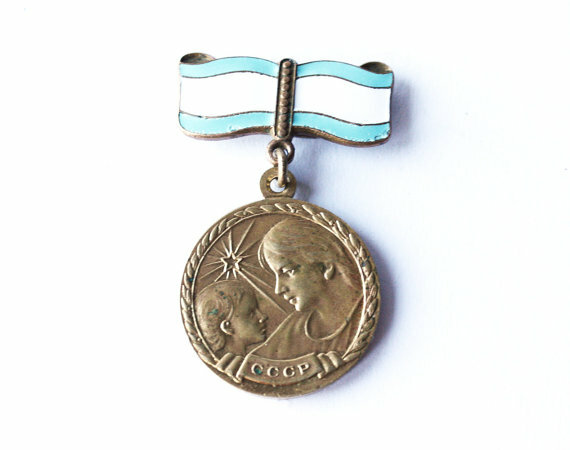 Some of the popular objects of Soviet nostalgia include Young Pioneer uniforms, USSR school uniforms, Soviet versions of Santa Claus (Ded Moroz), items with Sputnik themes and CCCP posters and pins. One of my favorite group pools on Flickr is My Happy Soviet Childhood. There are only 315 images in the pool, including several pictures of the Soviet Union equivalent to Generation X. As I perused them I had a stunning realization. Generation X was the last complete Soviet-era generation to fully come of age behind the Iron Curtain. So, I did some research via search engines and I found out that a documentary has been made about this. It’s called My Perestroika, and it follows five ordinary Russians from their sheltered Soviet childhoods to the collapse of the Soviet Union. It was screened at Sundance last January. In recent weeks, Russia has seen unprecedented protests against fraudulent elections. Thousands of people have collected in the streets of Moscow demanding true democracy. You can keep up with the movement via the Occupy Russia Facebook page. Do you have feelings of nostalgia for the Soviet Union or nostalgia for the old USSR? Click here to see some magical Cold War Family pictures and Russian photos. I feel the same way. I read somewhere a few years back that highlighted how much safer the world was when there were two super powers that hated each other. what good is the red phone now? sad. I’m nostalgic for a global opponent which, even though it was misguided and malignant, never dreamed of strapping bombs to people and blowing them up. Give me a Commie tank over a terrorist any day. I miss the innocence I had as a child in the 50s(I AM A MIGHTY BOOMER) vis a vis AMERICANS are good; RUSSIANS are bad. Somehow, even at an early age, I remember being very leery of all that political positioning and fear-mongering on the part of the newscasters and many of our adult neighbors (The Greatest Generation-types). See, they sounded just like that when they defended segregation and “Our Southern Way of Life”, which I already knew from Sunday School was NOT WWJD! @TERRITORYMOM – With every comment you leave I’m stunned by how much we have in common!!! Very interesting. I remember how we had to hide under our desks at school during bomb drills. I can’t imagine making kids go through that today. I had such a fear as a child that we would be bombed. So unnessessary. Ironically I went to Russia six months after the coop, so the 20th anniversary is coming up in April. It was a mission trip with my grandfather who was a minister. He spoke at an old sports arena. It was wild like a rock concert. We went to schools and orphanages and handed out Bibles. The people were amazingly friendly and eager to listen to our message. I spent my 27th birthday in Siberia. Our interpreter gave me his passport cover which had CCCP on it. I could go on and on about my trip. I will do a post about it soon.